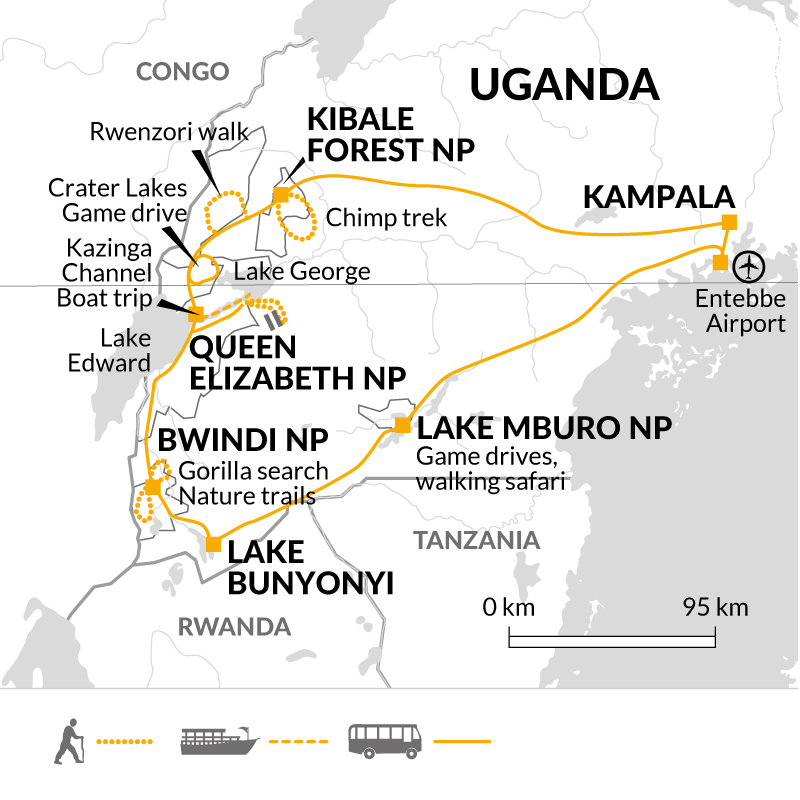 A visit to Uganda and the opportunity to witness the rare mountain gorillas in their natural, pristine environment presents one of the most evocative and memorable travel experiences to be found anywhere. The very survival of the mountain gorilla depends upon the willingness of communities to embrace the concept of responsible/sustainable tourism, and to see the long term benefits of protecting these magnificent animals - as opposed to the short term gains of poaching. In conjunction with a Ugandan operator we work to ensure that our tours offer financial benefits to the communities on both national and local levels - eg park fees bring vital hard currency into the country a proportion of which goes directly into gorilla conservation: there is the localised employment of guides/drivers and camp staff. Traveling in small groups we maximize the benefit to local suppliers ensuring that we do make a difference to the lives of the people of Uganda. We are donating £50 for each person booking on to this tour for departures this year, to the Gorilla Organisation. The most memorable part was seeing the Gorillas of course. We had a tough 2.5 hours climb to get to them. The last hour was pretty steep through thick jungle but that made it all the more worthwhile. We got to sit and watch them for a short time and then had to chase down the mountain after them as the silverback as 'sorting out' one of the cheeky youngsters. I would say the most exciting bit was the white water rafting down the Nile. It was grade 4 & 5 in places which was great fun. It was so good we went back at the end of the trip and did it again. This time my husband went river boarding - going down on a boogie board with fins on. He went down the same route as the rafts and thought it even more exhilarating than the rafting. We went with a company called Adrift for this. Make sure you do this now as apparently they are going to dam the river and the rapids will disappear next year. What a shame. Overall it was an excellent vacation. (4 star). Other highlights apart from the gorillas was seeing 3 leopards one morning in QE Nat Park and also some tree climbing lions sunbathing in the trees in Ishasa. Hadn't expected that. The boat trip on Kazinga channel is the best one I have been on. Couldn't believe how many hippos, elephants, crocodiles, water buffalo, birds etc we saw. Previous boat trips like this have been rather boring but there was so much to see on this one. It was also great to get some luxury by staying at the nearby Mweya Lodge. Hope this feedback helps. We shall certainly use your site again when we are booking our next vacation.